Born into a warrior caste in a far-off land, Sajan fled his duties and home in search of his missing twin sister, a fellow martial artist. Under sentence of death in his homeland for desertion, he obsesses over finding clues that could lead him to his twin. 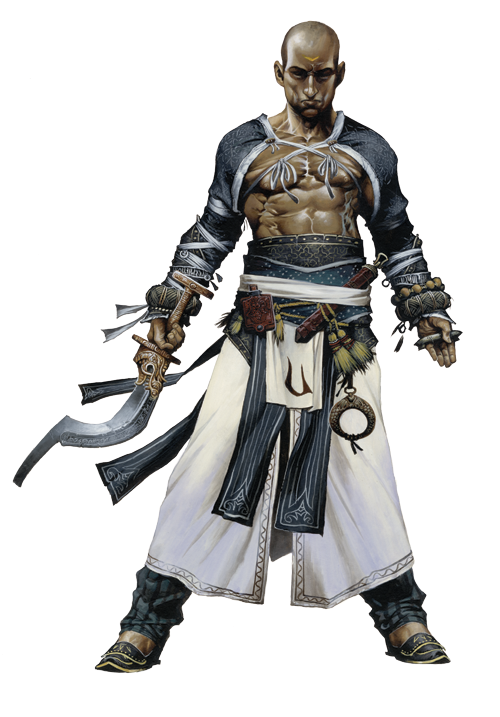 During Combat Sajan uses his fast movement and Acrobatics to get into a strategic location in combat, and uses a combination of Combat Reflexes and flurry of blows to deal as much damage as possible to his targets. He employs combat maneuvers when doing so is strategically advantageous—grappling spellcasters and tripping foes with his temple sword when his allies flank them. Against a particularly powerful single enemy, he utilizes Stunning Fist to take the combatant out of commission. When overmatched, he's quick to withdraw and use his +1 shuriken to harass a foe at range or from more defensible ground, or by using his speed to keep just out of reach. Far from the Inner Sea region, in the mysterious land of Vudra, Sajan and his twin sister Sajni were born into the padaprajna warrior caste. The siblings trained and served as partners, each complementing the other's technique, and became talented martial artists. After numerous victories, however, the siblings were separated when their lord was defeated, shamed, and forced to cede half his army to the victor—among them Sajan's sister. Sajni was taken away from Vudra by her new master and placed upon a ship as tribute to a distant lord. Daring disgrace or even death, Sajan abandoned his responsibilities to follow, so unwilling was he to condemn Sajni to life in the barbaric lands to the west. Eventually he tailed her all the way to Absalom, the City at the Center of the World, but lost her among the travelers and treasures of a hundred nations. Still, Sajan has not yet given up hope. He continues to seek any clue that might point him toward his sister, and has traveled far from Absalom and performed many heroic deeds in return for even the barest of rumors.